A map of Florida showing the Florida South Railway's land grant, published in 1888. The map includes information about towns along the railway, facts about Florida, and hints for potential immigrants. The Florida Southern Railway was established in 1891 when it took over the Gainesville, Ocala and Charlotte Harbor Railroad. Facing foreclosure, the line was acquired by Henry B. Plant (1819-1899) as part of his Plant System in 1892 and reorganized as the Florida Southern Railroad, which stretched from Gainesville to Ocala and then to Punta Gorda. In 1903, the Florida Southern was acquired by the Atlantic Coast Line Railroad (ACL). The ACL merged with the Seaboard Air Line Railroad (SAL) in 1967 to form the Seaboard Coast Line Railroad (SCL). Much of the original ACL lines are now part of the CSX Transportation line, which operates the SCL. Original 24-page map, 1888: Matthews, Northrup and Company. Map of Florida Showing the Land Grant of the Florida South Railway. Map. Buffalo, NY: Art-Printing Works, 1888: Maitland Public Library, Maitland, Florida. Digital reproduction of original 24-page map, 1888: Matthews, Northrup and Company. Map of Florida Showing the Land Grant of the Florida South Railway. Map. Buffalo, NY: Art-Printing Works, 1888. General Collection, RICHES of Central Florida. Originally created by Matthews, Northrup and Company and published by Art-Printing Works. Copyright to this resource is held by Maitland Public Library and is provided here by RICHES of Central Florida for educational purposes only. "Episode 25: The Railways of Central Florida." RICHES of Central Florida. http://riches.cah.ucf.edu/audio/Ep25-RailwaysOfCentralFL.mp3. Mulligan, Michael. Railroad Depots of Central Florida. Charleston, SC: Arcadia Pub, 2008. Murdock, R. Ken. Outline History of Central Florida Railroads. Winter Garden, Fla: Central Florida Chapter, National Railway Historical Society, 1997. Turner, Gregg M. A Journey into Florida Railroad History. Gainesville: University Press of Florida, 2008. "Our Evolution and History: CSX." CSX. http://www.csx.com/index.cfm/about-csx/our-evolution-and-history/interactive-timeline/. Matthews, Northrup and Company. 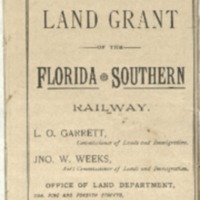 “Map of Florida Showing the Land Grant of the Florida South Railway.” RICHES of Central Florida accessed April 18, 2019, https://richesmi.cah.ucf.edu/omeka/items/show/7687.